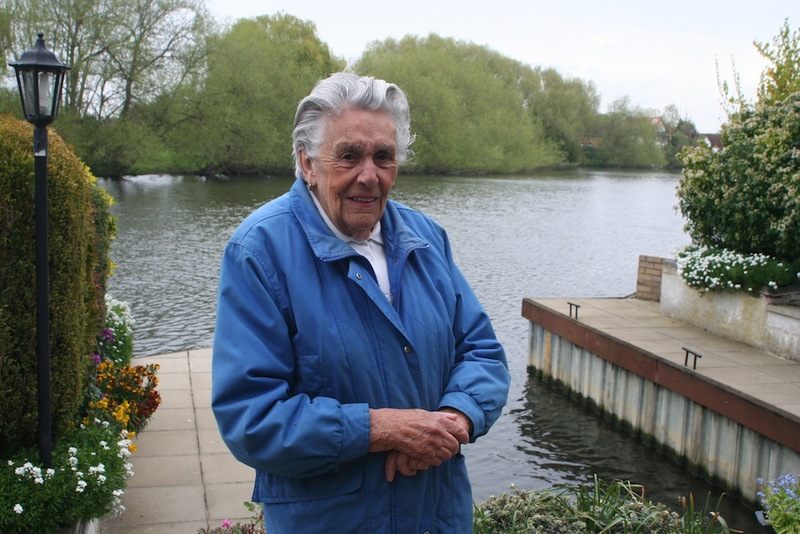 Muriel Gooding – Micki to her friends – has lived beside the Thames just off Chertsey Lane in Staines for 44 years and in that time, she’s experienced quite a lot. This lovely lady, now in her 80s, is what I like to describe as a real river person. Sure, she wanted to live by the Thames because of the fabulous view from her living room and garden – but Micki is one of a fast vanishing breed – someone who cares passionately about the river and wants to preserve the best parts of it for future generations. “My husband, Philip, and I used to live in Ashford,” she told me “but when our children were grown up we decided that we’d like to live beside the river and started looking for a suitable house to buy. And the irony was that she didn’t find her current home on one of those trips but in the small ads in the Sunday Times in 1968. Now bear in mind that this was back in 1968 when virtually anything legal had to be signed by the husband – the wife’s signature simply wasn’t accepted on its own. But that didn’t deter Micki. When her husband returned, the first thing he did was to complain because he hadn’t had many letters from her. “Well, I’ve been a bit busy,” she said. “Doing what?” He asked. “I’ve sold the house in Ashford, I’ve found a new house by the river near Staines and all that needs to happen is for you to sign the paperwork,” was her reply. The couple moved in and Micki just loved watching the wildlife on the river from her living room window. One of Micki’s favourite pastimes was to wander up and down the Thames in her electric launch ‘Shona’ (she chose an electric boat so as not to frighten the wildlife) but sadly she had to give that up because of failing eyesight. But it was that poor eyesight that accidentally brought her into contact with one of her favourite birds. “I was aware that a bird had got trapped in the house,” she said. “It was fluttering about by the window and eventually I caught it in a duster and just sat there stroking its head and back waiting for it to calm down. It was only when I ran my fingers along its needle sharp long beak that I realised it was a kingfisher. All those years I’d loved watching them and the closest I got to one was when I couldn’t see it properly!” Very frustrating. Micki vividly remembers the terrible floods of 2003 when her riverside home came within inches of being swamped. Fortunately it was built above the flood line from 1947 and she escaped but there were several anxious days. Micki’s son, David, who now lives with her, shares his mother’s love of the river and the two of them are always watching out for the plethora of wildlife that regularly pass by the window. I can think of many worse ways to wile away the time. Thanks for telling me your story, Micki. Just where are the birds coming from?